We can’t have another Nixon. I voted for Richard Nixon in 1972. I deeply regret that vote. For the next two years, Nixon’s lack of integrity paralyzed and divided the American nation until he was forced from office to avoid impeachment in the summer of 1974. Those were dark times in America where daily congressional hearings, constant bickering, and finally the first resignation of a sitting American president cast a dark shadow over the United States. It took years to emerge from that awful cloud of deception. Richard Nixon possessed many laudable political skills. But at heart he was a foul-mouthed, hate-your-enemies kind of guy who became infamous for ordering a burglary at a non-descript apartment complex in downtown Washington D.C. then covered up his crime by lying. The Watergate burglary eventually exploded into a Constitutional crisis while the nation drifted for years. Daily briefings, hearings, accusations, and political gridlock paralyzed our national government. After the John Dean smoking gun came forward, and it was revealed that President Nixon kept a secret tape recording of all of his conversations in the Oval Office. Congress moved to impeach the president and Nixon abruptly resigned. That was a sad time in American history–all attributed to lies. An individual, a family, and a nation cannot function in this world without trust–a basic integrity that when you speak, you are telling the truth. Richard Nixon was a pathological liar. Years ago, well-known pundit William Safire said the same about Hillary Clinton. Her recent behavior while running for president only confirms his insight. 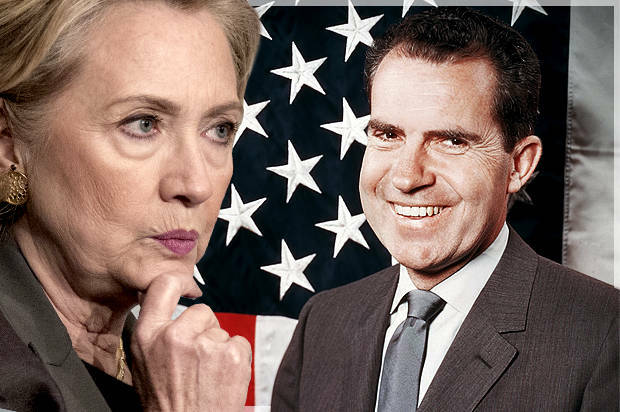 In 2016, we face the same numbing political paralysis if Hillary Clinton is elected president. The headlines are also an omen. A restoration of the Clinton presidency would be a restoration of the national and moral chaos they invariably create. They can’t help themselves. They are corrupt and corrupters, the ­Typhoid Mary of politics. Maybe the “Brexit” Brits are rooting for a new American Revolution that they can believe in. A week from today we choose the leader of the free world. Both candidates are flawed people. But one is a change-agent with a great VP. The other is a pathological liar with a weak running mate. We can’t afford another Nixon. I agree with your assessment of Hillary. But I still can't come around to your position on Trump. From my point of view, he is no more honest than Hillary, except that when he says crazy stuff that is obviously impossible or untrue, he actually seems to believe it, so maybe technically that isn't lying. I think either of the two in office will be a national disaster similar to what you described, and I can't in good conscience vote for either of them.